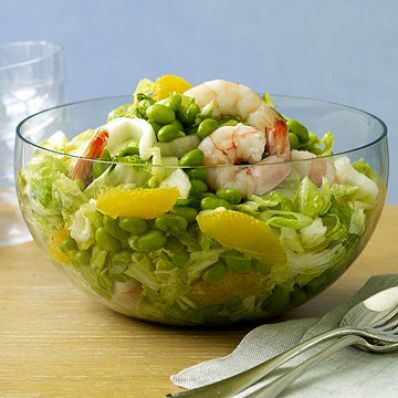 Chunks of oranges add a citrus touch to this salad that combines edamame, shrimp, and cabbage drizzled with a sweet and savory Asian-flavored dressing. 1 of 3 Heat a medium-size pot of water to boiling. Add edamame and cook as per package directions, about 5 minutes. Drain, cool and shell beans from pods (you will have about 1-1/4 cups). 2 of 3 With a sharp knife, cut peel and white pith from oranges. Following membranes, cut out orange sections and place in a small bowl. Squeeze any extra juice from membranes into bowl, then discard membranes. 3 of 3 In a large bowl, combine edamame, orange sections, shrimp, cabbage and scallions. 1 of 1 In small bowl, whisk together vinegar, hoisin, sugar, sesame oil, soy sauce and 1/4 teaspoon of the salt. While whisking, add oil in a thin stream. Add dressing to bowl; toss to combine. Season with remaining 1/4 teaspoon salt; serve.